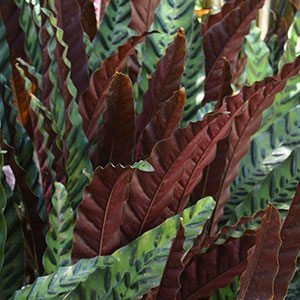 This is an evergreen plant grown for the foliage, and Calathea insignis does have brilliant foliage. With both colour and texture, the foliage stands upright, a mid green with darker green markings. To add to the impact, the reverse of the foliage is a ruby red. This Calathea species is really a tropical plant, and it grows well outdoors in sub tropical to tropical climates. It is also widely used as an indoor plant and it will grow well in these conditions. Commonly called the ‘Rattlesnake Plant’, this is a shade loving plant and works well planted beneath tall plants. It will spread to form a clump and is easily propagated by division. Best grown in light shade, in a humus rich soil, moist yet well drained. Choose a position in dappled shade. Dappled shade is essential to prevent the foliage from burning. Prepare the soil by digging in well rotted compost and aged manure. Water well during long dry periods. Fertilise using a good organic type fertiliser in spring. Top up the mulch each year. Temperature range – Try for a minimum of 15C and up to 25C. Position – Bright filtered light in a position away from both cold drafts and air conditioning / heating ducts. Watering – Water regularly in the warmer months, let the soil dry a little between waterings. A little less winter in colder months, even indoors. Growing medium – Use a good quality free draining potting soil. Fertiliser – Use a slow release fertiliser in spring. Humidity – This is plant that requires a humid environment. Try mist spraying, or sit the pot on top of pebbles in a saucer of water. Do not sit the pot in water. Leaf Curl – Usually from under or over watering. sometimes due to lack of humidity. Yellow leaves – Either from over watering or as part of the ageing process. Brown leak margins – Usually from lack of humidity. Wilt – Overwatering in winter can cause the plant to wilt.